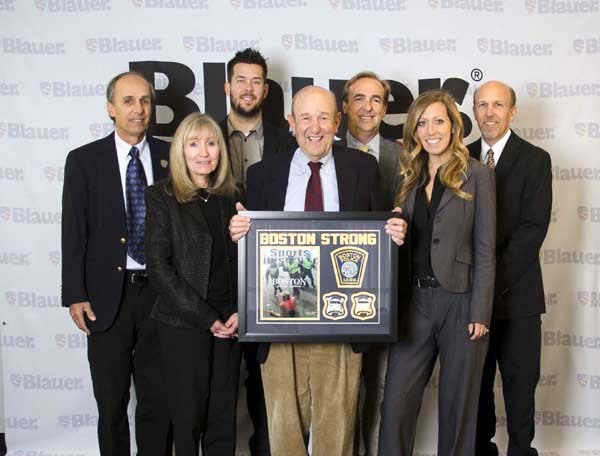 The Blauer Team: Pictured above left to right: Michael Blauer, Sharyn Proia, Adam Blauer, Charles Blauer (holding plaque) Billy Blauer Blauer (behind Charles), Ali Blauer, Stephen Blauer (on the end). Last spring, not more than a mile from the Blauer offices in Boston, our faith in law enforcement and public safety was reinforced when seconds after the marathon bombing hundreds of local and state law enforcement and emergency medical personnel made the decision to run towards the active blast sites to assist the wounded and control the scene. This level of bravery was maintained throughout the weeks following as local, state, and federal officials worked to ensure public safety and order while searching for the cowards who perpetrated such a horrific act of terrorism. Four generations of Blauers salute the men and women of the Boston Police Department, MA State Police, Boston Fire & EMS, and the local and federal FBI agents for their selfless work in protecting the public during this tragic event. For this reason, we are especially honored to welcome Boston Police Officer Rachel McGuire to our 2014 catalog. You may have seen her picture on the cover of the Marathon issue of Sports Illustrated, as well as the more recent cover with David Ortiz of the Boston Red Sox. She is the newest addition to our team of models, all of whom are active public safety professionals. See photo below for a picture of Rachel on the famous Sports Illustrated Cover. 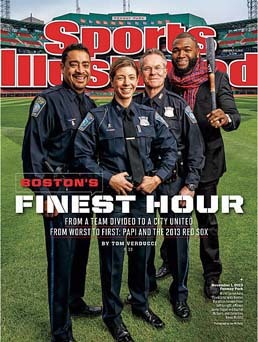 She is pictured with Officer Javier Pagan and Detective Kevin McGill and of course Red Sox Slugger, David Ortiz. As you’ve come to expect from Blauer, we are constantly expanding our offerings. Please take a few minutes to read about ArmorSkin®, our revolutionary ballistic vest cover and duty belt suspension system, which is receiving stellar reviews from departments around the country. Armor skin video: skip the ad. All you will need to know about this breakthrough technology for ballistic armor. Our new line of tactical boots features the breakthrough BOA lacing system. Try on a pair and see how you can have it all in a duty boot – instant comfort, great support, and ease of use. We thank you for your continued support of the Blauer brand. We look forward to bringing you more of the most protective and innovative public safety gear for years to come.